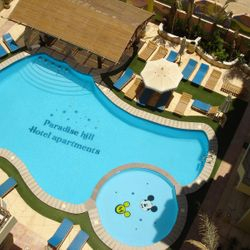 Paradise Hill Apartments - a new up and coming area, near to the Arabia Azur and Sunny Days holiday resorts in the Arabia district of Hurghada, Red Sea, Egypt. 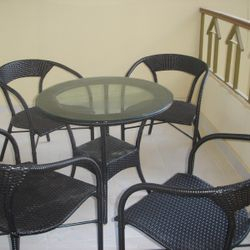 Has a selection of cafe's, restaurants, bazaars and beaches in the immediate vicinity. 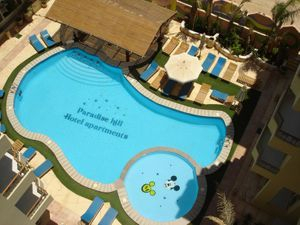 A new development of apartments located in the Arabia area in downtown Hurghada, on an elevated plot. 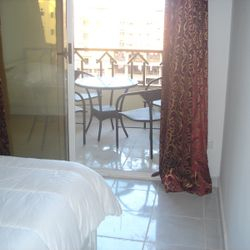 There are a total of 117 units made up of studios, 1, 2 & 3 bedroom apartments as well as duplexes. Suitable for Couples, Singles, Families and groups. Ideal for those wanting either Water sports, Diving, Fishing. Golf, Nightlife, it's all a short distance away, or even if you're just wanting a relaxing holiday in the sun. 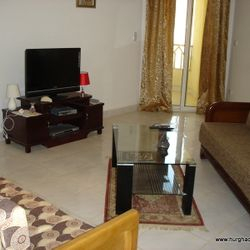 Because of it's central location, Hurghada makes an ideal base for visiting most of Egypt's Ancient Sites. Only 50 minutes by plane to the Great Pyramids of Giza and all the other fabulous sites that Cairo has to offer. Luxor can be reached by coach or private car in around 3 - 4 hours, where you can visit Valley of the Kings/Queens and Karnak Temple, and of course much more. 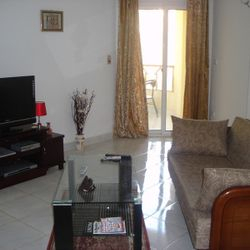 This spacious, 3rd floor, 1 bedroom apartment, is fully equipped for a self catering holiday. Lounge - with Sofa bed. Coffee Table. 32'' Flat screen Satellite TV. Dvd. Air Conditioned. 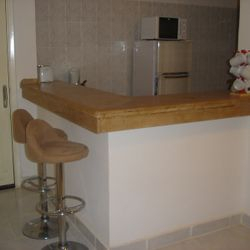 Kitchen - Fully equipped kitchen. 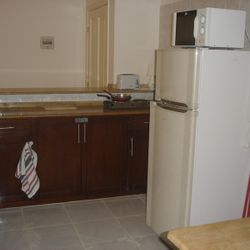 2 Ring Hob Microwave Fridge Freezer Toaster Kettle Pans Utensils Crockery Cutlery. Bedroom - has king size bed + dressing table and double wardrobe. Air Conditioned. Bathroom - has Bath with Over Bath Shower, Toilet and Wash basin, Water Heater. Balcony - overlooks the Swimming Pool and has patio furniture to seat 4. Linen and towels provided. Linen change end of week. 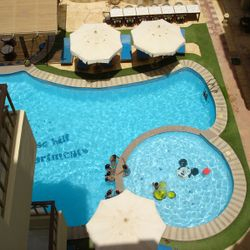 Swimming pool with child area surrounded by landscape garden with Pergola Bar, sunbeds and parasols. Communal roof terrace, which has panoramic views of Hurghada and the Red Sea. 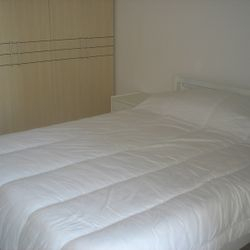 Short term rent includes water and electric + bed linen and towels are provided. 10 minutes from Hurghada Airport. 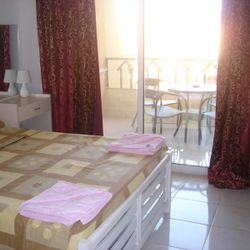 Downtown Sakalla, Nightlife, Shopping, Marina etc 1km. Airport transfers available £15 return, if required.